A song about Bob Marley’s three backing, songbirds – The I-Three – is now a musical production and heading to a Times Square theater one day after his 69th birthday anniversary. The lyrics he penned and named “Three Little Birds” was transformed into a children’s book written by his eldest child Cedella and it is that version that is slated to open at the New Victory Theater on Feb. 7. The premiere event kicks off 17 performances that begin on Feb. 7 and run thru to Feb. 23. 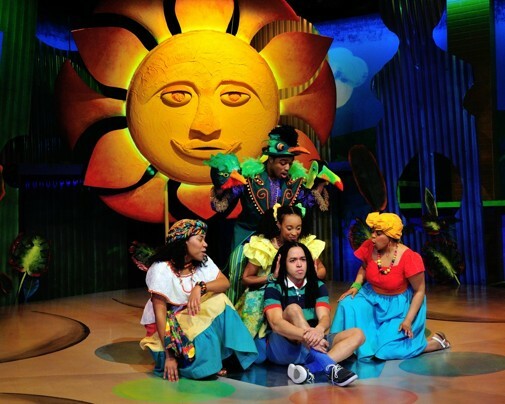 “Bob Marley’s Three Little Birds” features a collaborative creation co-written by Cedella Marley and Gerald Hausman in conjunction with the Marley family and Adventure Theatre MTC. The latter premiered the production as part of the theater’s African-American Adventure series last year. “I wanted to find a work that celebrates culture without making race a plot point and discovered ‘Three Little Birds,’” Adventure Theatre MTC producing artistic director Michael J. Bobbitt said. Allegedly he worked closely with Ms. Marley to weave story, song and dance into a new musical for kids. “Even though Jamaica is not an American province, Bob Marley and reggae has influenced a lot of African American culture, and plus, kids love the music,” he added. “Dad had so many kid-friendly songs,” Cedella Marley stated. The cast comprises Talibah-Aquil (Female Swing), S. Lewis Feemster (Duppy), Ayanna Hardy (Cedella), David Little (Doctor Bird), Michael J. Mainwaring (Ziggy Understudy), Jobari Parker-Namdar (Ziggy), Tara Lynn Yates-Reeves (Tacoomah), Jade Wheeler (Nansi Understudy), Brittany N. Williams (Nansi) and Galen J. Williams (Male Swing) — all of whom bring the lyrics and messages of Bob Marley’s original tunes to life. The New Victory Theater is located at 209 West 42nd St. in Times Square.